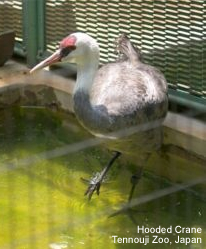 The Hooded Crane (Grus monacha) is a small, dark crane. It has a darkish-grey body. The top of the neck and head is white, except for a patch of bare red skin above the eye. The Hooded Crane breeds in south-central and south-eastern Siberia. Breeding is also suspected in Mongolia. Over 80% of its population winters at Izumi, southern Japan. There are also wintering grounds in South Korea and China. The estimated population of the species is between 9,500 individuals. The major threats to its survival are wetland loss and degradation in its wintering grounds in China and South Korea as a result of reclamation for development and dam building.